In addition to the current operations, Automotive Lighting - Magneti Marelli’s business line devoted to the automotive lighting sector - is integrating in Juárez production site in Mexico, a new assembly operation for LED modules. This further enlargement of production of advanced lighting technologies is aimed at satisfying high technology applications and customer needs in a market like NAFTA, in which the LED technology penetration for front lighting is expected to grow from approximately 20% in 2016 to approximately 50% in 2020 (source: IHS - AL). Juárez LED operation will start with the involvement of 115 employee (165 by 2016), and grow to nearly 400 people by the end of 2017. The Juárez production site, which started to produce headlamps in 1997 is one of Magneti Marelli’s largest plants with over 3,000 employees producing various lighting products. It manufactures head lamps, tail lamps, rear appliques, and various electronic modules. Juárez has a strategic position to serve the automotive production hubs in the US of carmakers such as BMW, Daimler, Ford, FCA, GM, Honda, Kia, Nissan, and VW/Audi. Concerning LED technology, on top of an average useful life longer than that of the vehicle itself, LED offers new possibilities in terms of safety, styling and lower energy consumption. The use of LED-equipped Daytime Running Lights also makes a significant contribution to a proper energy balance, since 75% of the total driving distance in the world is covered during the daytime. In specific terms, DRLs with LED technology offer an energy consumption of 14 W (with 0.36 g CO2/km) per vehicle. When regular low beams are used instead, energy consumption is approximately 300 W (with 7.86g CO2/km). This means 20 times more energy consumption compared to the LED daytime running lights. The main advantage offered by white LEDs lies in the colour of their light, which is also known as the colour “temperature”. Reaching approximately 6,000° Kelvin, the intensity of their light is just about the same as the quality of daylight. The human eye perceives the road and the edge of the roadway at night in their natural colour, and can distinguish contrasts much more easily. 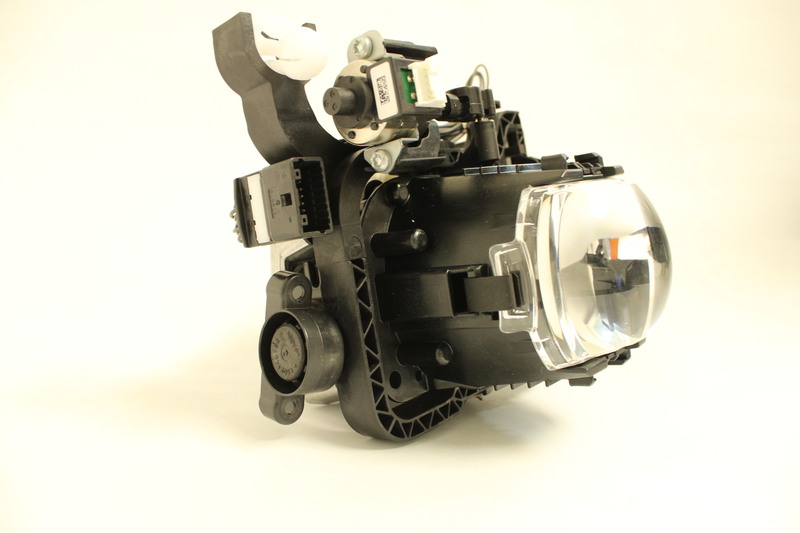 The Automotive Lighting division of Magneti Marelli develops technologically advanced automotive lighting solutions. With approximately 21 million headlamps and 28 million rear lights produced annually, Automotive Lighting represents one of the main areas of Magneti Marelli’s business footprint as well as one of the leading players at the global level in the lighting sector. Some of the Automotive Lighting’s main innovations in the technological evolution of this sector have been the introduction on the market of the first Xenon headlamps in 1991, the Xenon Dynamic Curve Light in 2003, and the first headlamp with active infrared module in 2005. Kicking off a veritable revolution in lighting technology, in 2008 Automotive Lighting launched the full-LED headlamp in mass production (for the Audi R8), with all lighting functions in LED technology. Then came the world’s first headlight to be equipped with an active infrared night vision system and, since 2010, the first full-LED headlamp with adaptive function (for the Mercedes Benz CLS). Last outstanding technological achievement, in 2015, was the first world application of the laser technology to production series cars, with an additional high-beam laser module.